Definitely serve this one warm with some vanilla ice cream or some whipped cream – it’s a great dessert that bakes up quickly and tastes so homey. Preheat oven to 375 degrees. 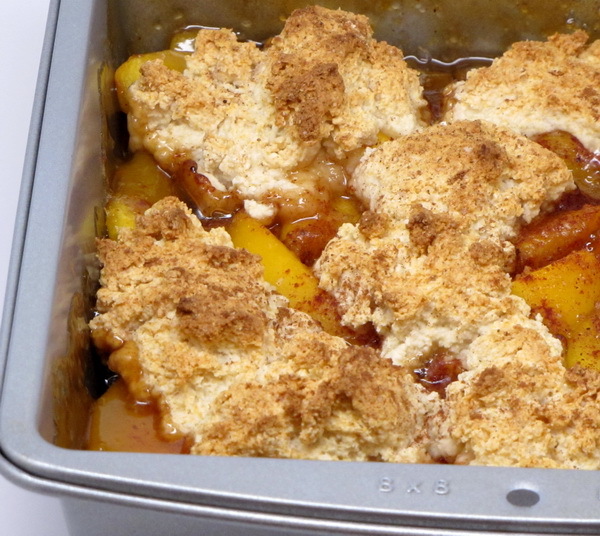 Mix peaches with syrup, brown sugar, tapioca, lemon juice and cook on medium heat until it comes to a boil then pour into 9 inch square baking pan. Stir Bisquick, sugar and milk until soft dough forms then drop by heaping tablespoonfuls onto hot fruit. Optionally sprinkle with a little more cinnamon then bake 28 – 30 minutes or until biscuits are golden brown.